Advancement in medical technology has made it possible for doctors to look at what is happening inside our bodies without the need to operate. This makes it possible to have a diagnosis at a low cost and very minimal intrusion to the patients. X-Rays are the oldest of these technologies, having been developed in the late 1900. It uses the radiation from a vacuum tube. The radiation can pass through soft tissue but not bones. The radiation that passes through is deposited into a photographic plate that is then developed to present the final image. An MRI can do the same thing but it is more advanced, understandably so since it was made almost a century after X-Rays. The name Magnetic Resonance Imaging gives you a hint that it uses magnetic fields to produce the image. In the simplest sense, an MRI uses a huge magnetic source like a fixed magnet or an electromagnet to align the magnetic moments of protons that is in the water in our bodies. For a short period of time, an electromagnetic field via RF is introduced. This causes the molecules to realign then slowly return to their original orientation. The rate at which these molecules returns to their original alignment is then detected by the scanner and plotted in a computer. To improve the image, contrast material is often injected to the patient. 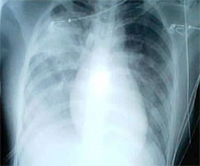 The primary problem with X-Rays is the danger associated with prolonged exposure. The radiation that passes through the soft tissue can lead to damage. This is why we cannot take a lot of X-Rays at a single time. MRIs do not have these problems as it does not introduce anything to the body. During a single MRI session, it is common practice to take a lot of cross sectional images of the body so that doctors have a lot more materials to work with. With the advancement of computers, these images can be reconstructed into a 3D image. It is almost like opening up the body and looking directly at the organs within and make their diagnosis a little bit easier and more accurate. Ben Joan. "Difference Between X-Ray and MRI." DifferenceBetween.net. October 16, 2009 < http://www.differencebetween.net/technology/difference-between-x-ray-and-mri/ >. I had the same problem x ray stated i got sliped disc and MRI stated i dont have sliped disc which one is the truef ?